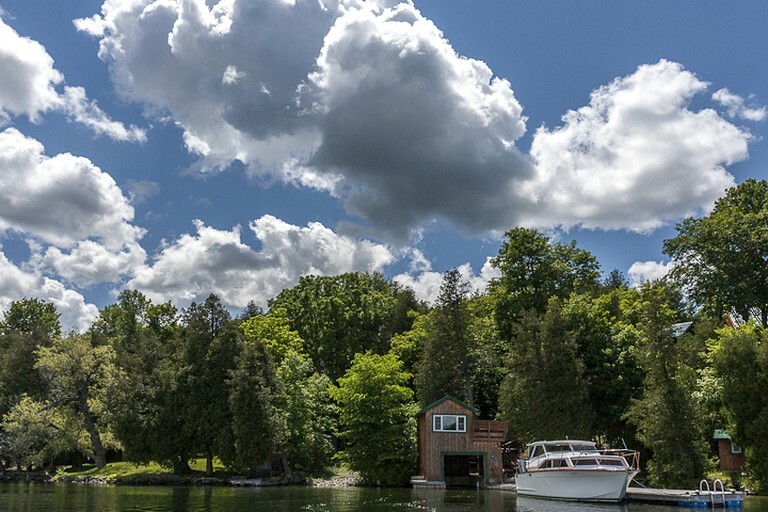 Check out this corporate treat complete with boat access in Portland, Ontario for a fun and unique business retreat. 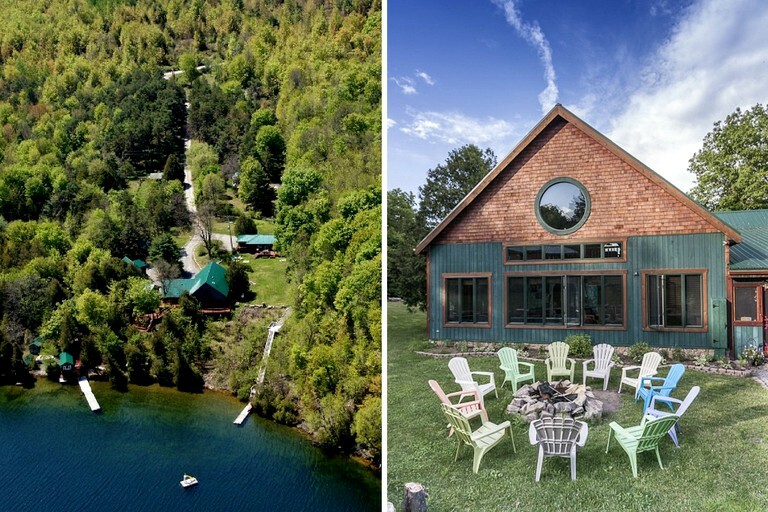 This large, lovely property is perfect for a business getaway filled with outdoor activities. The entire property sleeps 30 in total, with sleeping space in all of the accommodations on the property, so there is room for the entire group. 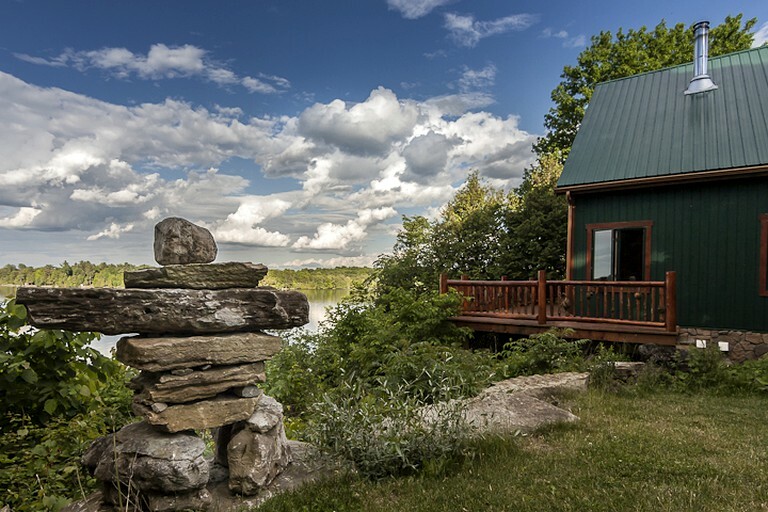 The accommodations include the main house, guesthouse, boathouse, and private annex. There is a 3,000 square foot main house that sleeps up to 10 guests. The main house boasts a variety of intricate decorations from all over the world. 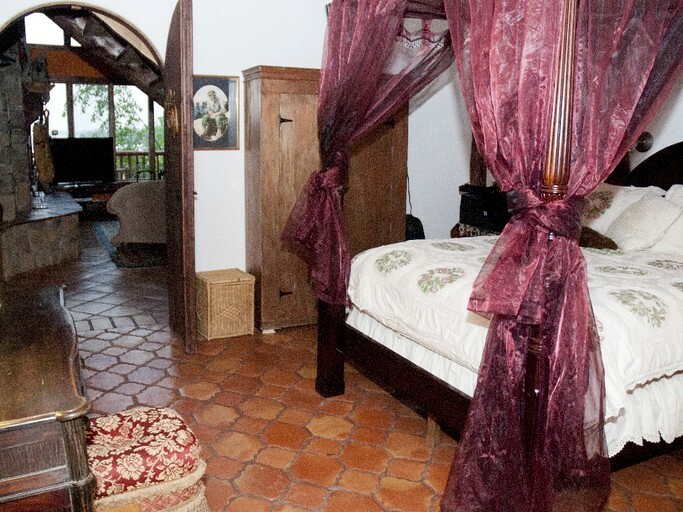 The main bedroom has a king-size bed, as well as a private full bathroom with large bathtub and stone shower. This bathroom also leads into the spa area, that includes the endless pool and infrared sauna. The second bedroom has a queen size bed with a make-up station, vanity, sink, and desk. 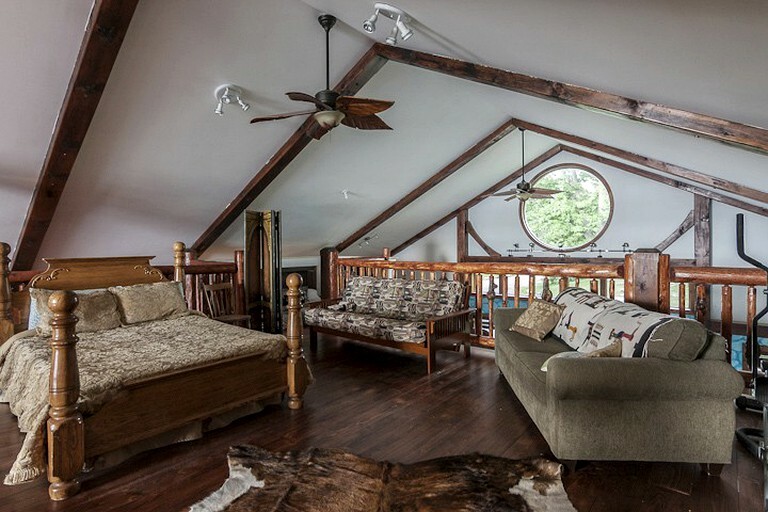 There is a double bed in another bedroom and a double size sofa bed in the loft. 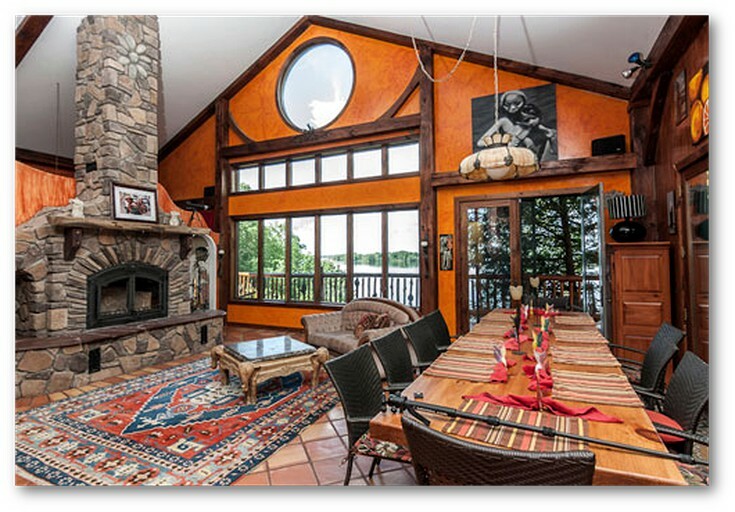 The living area has high ceilings, a floor-to-ceiling stone fireplace, and a great view of the lake. The spacious kitchen has all of the amenities that has everything that guests need to cook dinner, make drinks, and entertain. Guests have use of the professional gas stove, oven, griddle, refrigerator, and microwave. 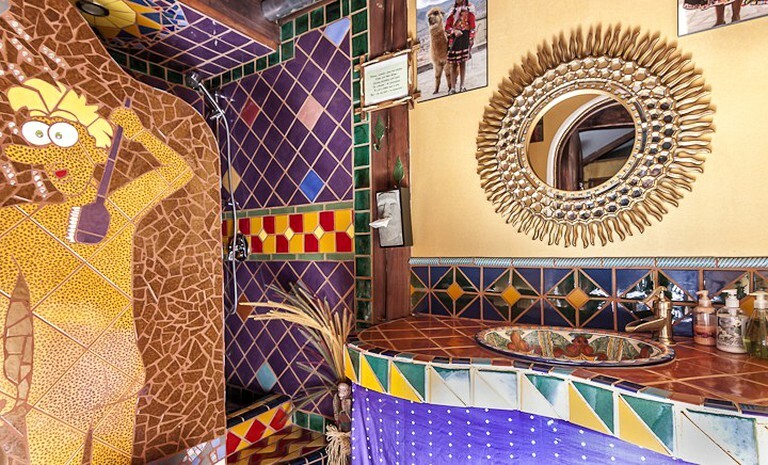 the kitchen also has two large sinks and two full bars. 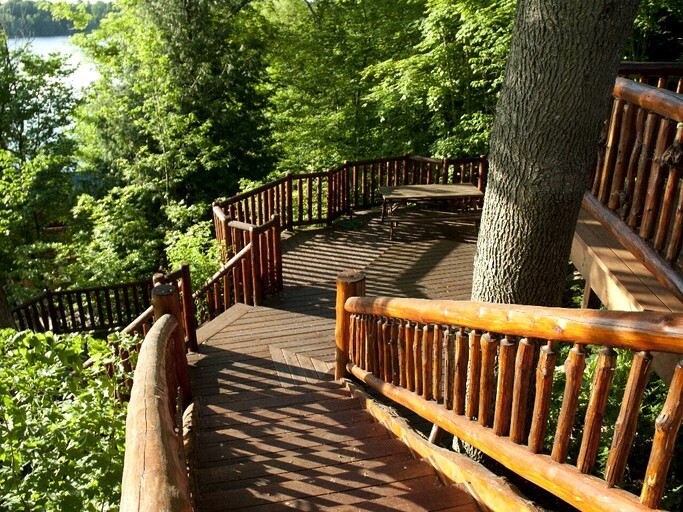 There is access to the large, wrap-around deck that overlooks the lake from the living are and the kitchen. There is also a large staircase that leads up to the loft, where guests also have spectacular panoramic views of the surrounding property. 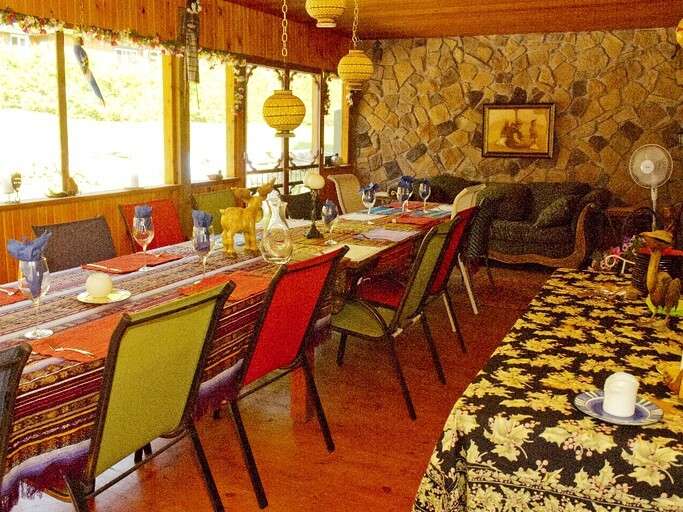 The guest house, located nearby, also accommodates up to 10 people. There are four bedrooms which include two queen size beds, and two bunk bed sets with double size beds on the bottom and single sizes on top. 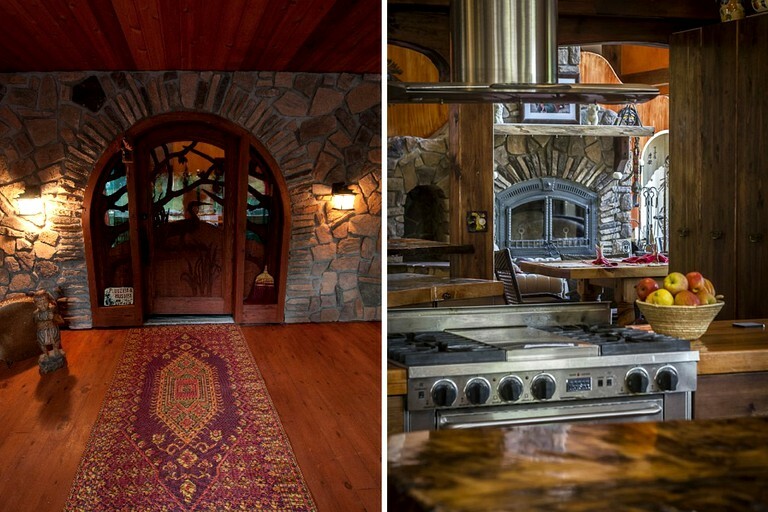 There is one bathroom, and a full kitchen with all necessary cooking appliances. There is a laundry room with a washing machine and dryer. The living area has a 22-inch television with satellite access, DVD player, video library, foosball table, and board games in case guests want to have a relaxing night at home. 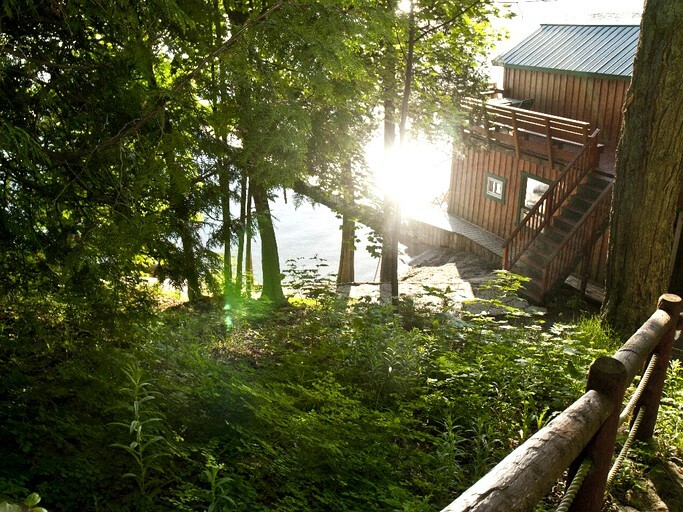 The lovely boathouse, that sits right at the water's edge, sleeps up to four guests. 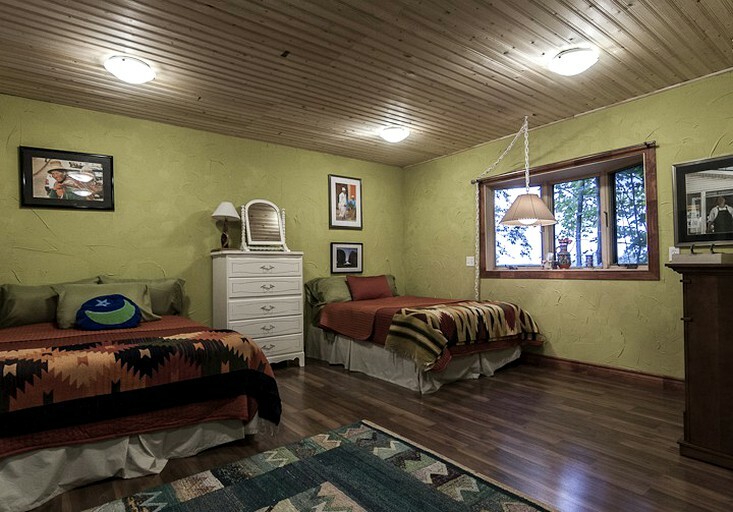 There is a set of two single bunk beds queen size bed that is situated to look over the lake. It includes a mini refrigerator and washroom with a composting toilet. 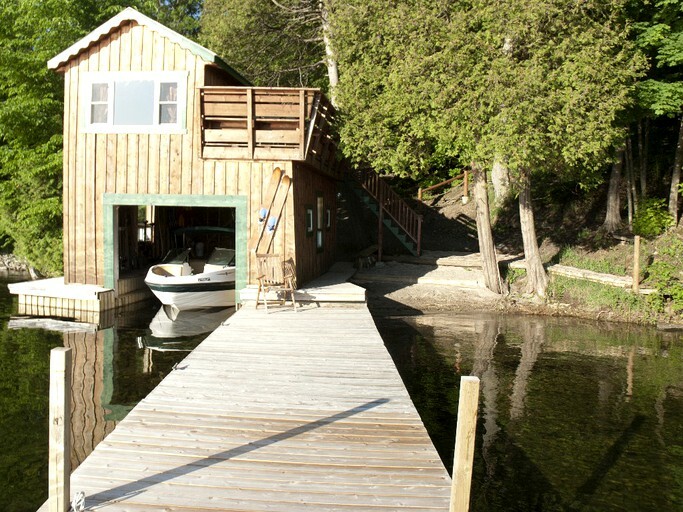 Those who stay on the property can either access the boathouse by a lovely stroll or ATVs. This special property goes above and beyond to provide guests with amazing facilities. Guests are provided with linens and towels, as well as the use of the washing machine, clothes dryer, and ironing board. The main house includes an indoor endless swimming pool that can turn into a jacuzzi and is great for swimming laps. The spa room also has an infrared sauna which is great for optimum relaxation. A hairdryer can be found on-site. The living area in the main house has a large fireplace that's perfect for cozy nights. Wi-Fi is available throughout the property. 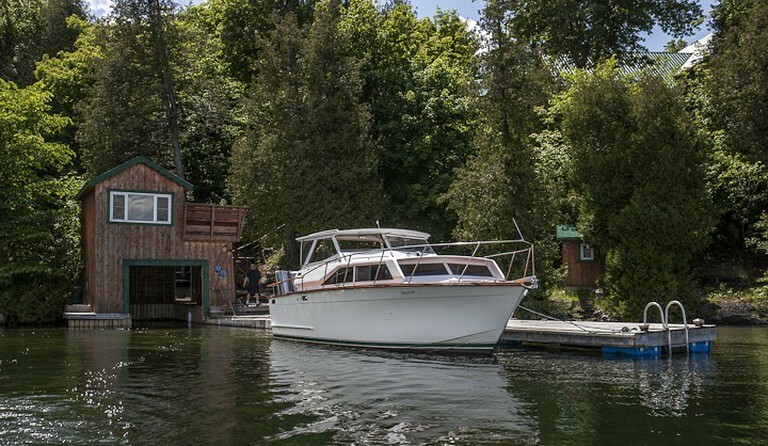 Outside, there is a private dock and boathouse, where guests can securely anchor their boat. The dock also includes a waterslide and swim raft, so during summer months guests can cool off and swim. Kayaks and one canoe are provided on the property as well. There are adult-size life jackets provided. 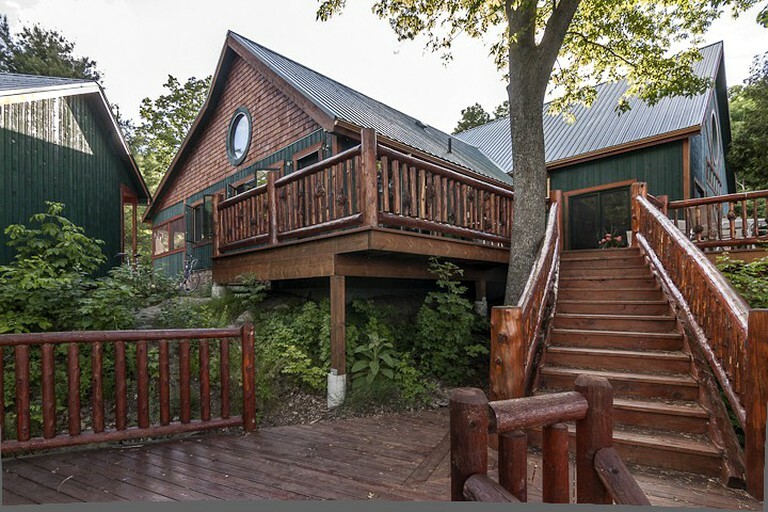 Guests can use and enjoy the large deck overlooking the lake the outdoor grill, fire pit, horseshoe pit, and hot tub. 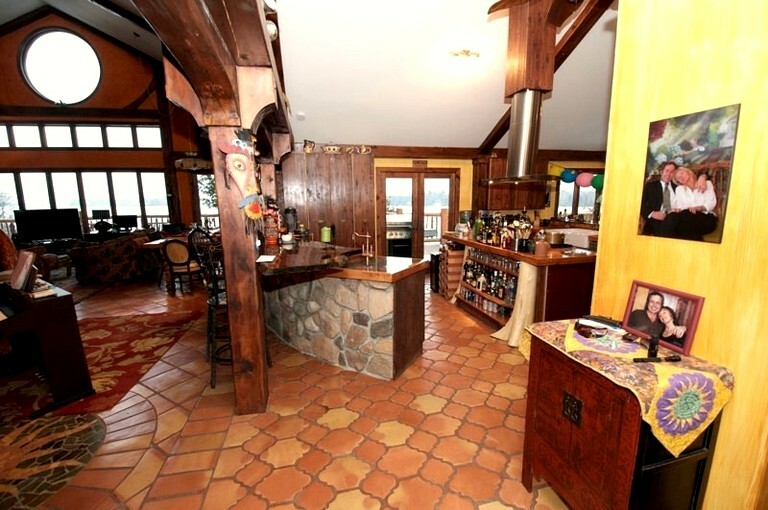 There are large full kitchens in two of the accommodations, with two uniquely decorated bars, so guests can make their own drinks. For further entertainment, there is a music station that includes a karaoke machine, drum set, and keyboard. On-site parking is available to accommodate RV´s and trailers. 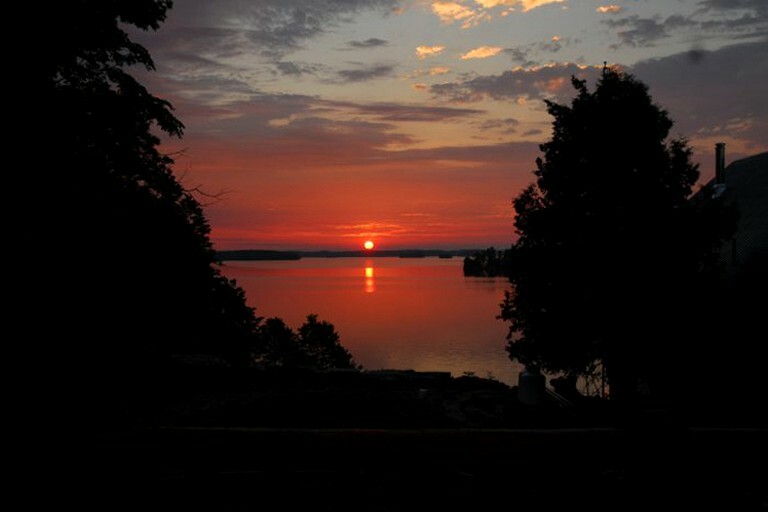 This part of Ontario offers many great outdoor activities. 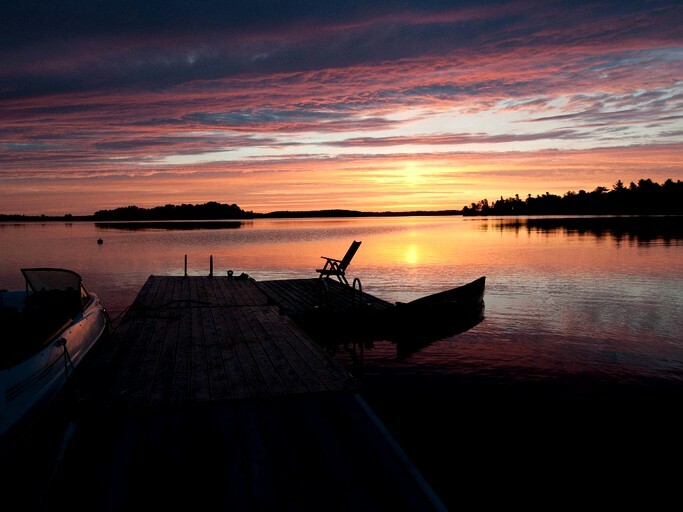 Fishing is the most popular pastime on Big Rideau Lake, and visitors come far and wide to experience the best fishing Canada has to offer. There is the 75-acre Winking Rosebud nature reserve that has many hiking trails which are perfect for exploring during all season. The nature reserve is popular for hiking, biking, and birdwatching during the warmer months and cross-country skiing and snowmobile riding during the winter. Boating is also popular among visitors and locals alike. 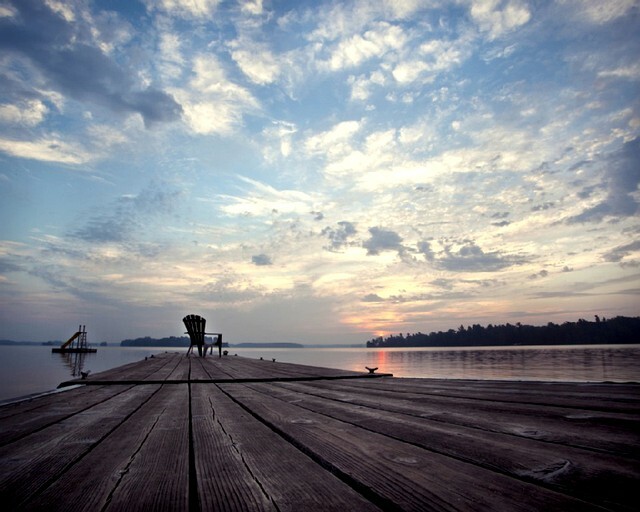 Water skiing, kayaking, canoeing, and paddleboarding are all accessible at Big Rideau Lake. There so much natural wildlife around the lake, so guests can get full views of flying eagles and running deer. There are many golf courses surrounding the property such as The Maples Golf Course, Lombardy Glen Country Club, Rideau Lakes Country Club, and the Evergreen Golf Course, so golfers should make sure to bring their clubs! It is at the discretion of each individual host as to whether the booking can be rescheduled to another available date. If you cancel at any time, you will not receive any refund. 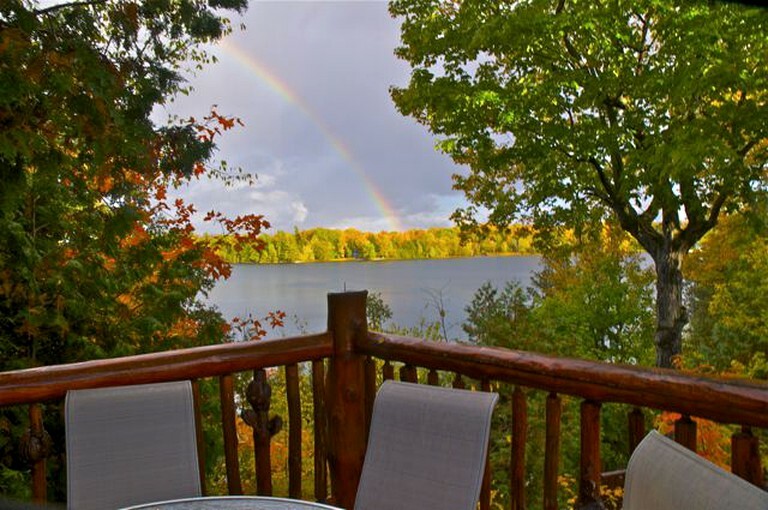 Guests are able to bring their own boat and dock it in the lake, but guests must speak with the host about size restrictions. This is a non-smoking property and pets are not allowed. There is a refundable damage deposit of $373.50. There is a three-day minimum stay during the regular season at the price of $2588. Guests can book a two-day stay, but the price will not drop. During the summer season, there is a seven-day minimum stay at the price of $6718. Special dates such as May 24th and Labor Day weekend of September 5th have special rates of $4851 for three days.